In Barcelona, at the beginning of the 20th Century, the destinies of two families, the Jufresas and the Navarros, converge: Francesc Jufresa is the head of the bourgeois family which runs the most renowned goldsmith workshop in the city. His daughter, the beautiful Laura, is a young rebel who challenges the social norms of the time, rejecting a future as a housewife and mother. She is interested in other things: a trip to Rome, on which she is introduced to some of the most avantgarde jewellery designs of the period, and her attendance at the bohemian gatherings of modernists in Barcelona set her far apart from most women of her class and time. Juan is the head of the Navarros, a poor family whose members must work hard to survive. Dimas, the first born, embodies his father’s hopes but is forced to leave his job as a city tram driver after an accident at work. Laura, who is working for Gaudí on the sculptures for the Sagrada Familia, and Dimas meet when he accompanies his younger brother to pray at the church. The encounter will change their lives forever. A magnificent homage to the genius of Gaudí in an exciting historical novel in which we tour the most bohemian parts of Barcelona. 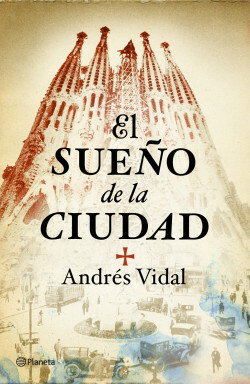 The enchantment of Gaudí and his spectacular Sagrada Familia form the perfect backdrop for an enthralling novel; part wonderful love story, part fascinating chronicle of the modernist years of Barcelona and a society about to change irrevocably.